It is said that the history of peoples who have a history is the history of class struggle. It might be said, with at least as much truthfulness, that the history of peoples without history is the history of their struggle against the State. Every effort to create and/or defend community will invariably pose the question of the State, for the former, in its fullest sense, is an expression of the capacity for groups of people to self-organise autonomously, in freedom and equality, whereas the State’s power rests upon exclusion and hierarchy. As stated, the opposition is simplified. But it underlines the anarchist intuition that freedom and equality are incompatible with representational, sovereign power (of any type), the historical (and ongoing) legacy of peoples living autonomously and rebelling and/or fleeing from the State, and the contemporary struggle for autonomies (in different ways-of-being-together). 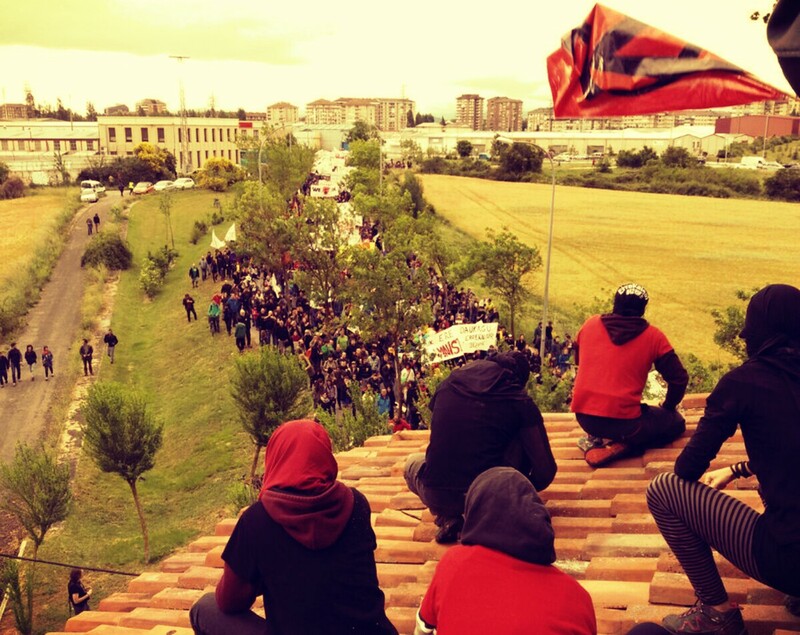 We have already had occasion to publish news about the occupation, and in solidarity, we continue this work. Errekaleor: A year after cutting off the light … and here we continue! Errekaleor is a working class neighborhood of Vitoria-Gasteiz built in the 1950s. Due to the urban plan of the PP [Partido Popular] municipality, the inhabitants were evicted, with compensation. Due to the economic crisis, the redevelopment project came to a standstill, and although most of the inhabitants had accepted the compensation, fifteen families refused to leave their homes. The council then allowed the neighborhood to deteriorate, to force its abandonment; this is a part of the city that invites avaricious speculation. In September 2013, young people from the city, with the support of the remaining neighbors, squatted in the neighborhood, starting a self-managed neighborhood project inhabited by people with totally different profiles: families with children, university professors, radio announcers, masons, the unemployed, students. “We intend to offer alternatives to the system, and we create them ourselves”. They have been the object of several attempts at eviction and, a year ago, electricity to the neighbourhood was cut with the excuse that the power installation was unsafe. But they made a virtue of necessity and launched a crowdfunding campaign in which more than 1,100 contributors, including private citizens and different groups and organisations, contributed, and by means of which they raised one hundred thousand euros in 35 days. They were in this way able to install solar panels so that Errekaleor could be more alive, more combative and more sustainable. The justification of the city council for the eviction and the demolition of the neighborhood (as it was for the power outage) were reasons of security. The inhabitants, therefore, shared the technical reports of the installation of solar panels and the security measures taken with regards to the electrical installation. They also took advantage of the anniversary to give 100MilaEsker (one hundred thousand thanks), at a press conference. We share the statement and a couple of videos. “Exactly one year ago, the neighborhood was filled with people armed to the teeth. They protected the workers of Iberdrola and cut the light of the neighborhood, with the intention of turning off Errekaleor. The next day, Gorka Urtaran [a city councillor in the municipal government] stated that he wanted to tear down the neighborhood, with the intention of hiding any ray of light. And here we continue! We showed that we were clear and that the people was alive. Thanks to thousands of people we made the leap from darkness to light and a year later we can say that Errekaleor is supplied by the sun’s rays and consequently it is sovereign energetically. But not only that: the buildings are in a better state, the walls have more color than ever and there are more projects than ever in this emotional experience that will soon be five years old. Although they beat us with the excuse of security, we already knew that the objective was political. With self-management as the axis, from the beginning we have worked for the rehabilitation of the neighborhood and for it to be safe to live in. Apart from demonstrating last year that the condition of the housing was good (thanks to a report endorsed by 16 architects), today we also have in hand a report that guarantees the electrical system of the entire neighborhood. They submerged us in the dark with the excuse of security, threatening our own security. But the coup was only an incentive to reinforce our small revolution. By questioning the energy model and private ownership of energy that is in the hands of a few men, we have made the leap to a neighbourhood model of sovereignty and feminism, as well as collectivising the ownership of energy. On the way to the energy transition, we have not only replaced fossil fuels with solar energy; knowing that we did not want to return to the previous model of consumerism, we have rethought the way of life of our community, we have ensured the care of all the neighbours, placing it at the center of our lives. Reducing the use of electricity by 90%, we have shown that another model is possible in this “Green Capital” that is said to be a reference. Let those who are so concerned about our safety be calm, since we have written a technical report of the project, with the explanation of the installation and safety regulations. This, together with the report mentioned above, is available at our website https://errekaleorbizirik.org. The analysis, therefore, is not so complex in this case: there was a bid to end our project by cutting off the light. And as the motto of the neighborhood parties that we will celebrate next week says, “OS HA SALIDO LA RANA” [the unexpected happened]. But having won this small victory does not lead us to relax our guard or make the ghost of demolition disappear. Far from making us complacent, we understand that the war they want to wage is much longer and that the bet against us is still on the tables of several government offices. Given this we continue to “croak” the City Council with initiatives such as 100MilaEsker day next Sunday, or opening the land to people from Victoria-Gasteiz, for example. Have no doubt. In this long resistance, in addition, we are not alone. In 2018, we are celebrating a common anniversary with our colleagues from Gaztetxe de Gasteiz, HalaBedi radio and the Auzolana “frontón” [court]. Furthermore, the next 6th of October, we will occupy all Gasteiz. Apart from these groups, there are many movements with which we have built up complicities. A special embrace for the companions of the ZAD of Nôtre-Dame-Des-Landes and for the companions of the Gaztetxes of Errotxapeya and Maravillas de Iruñea that have recently been threatened. This entry was posted in Commentary, News blog and tagged autonomy, Occupations, Okupations, revolution, spain. Bookmark the permalink.